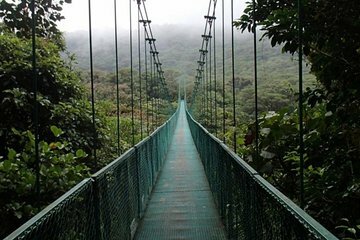 During this all-day guided tour, explore Monteverde, a popular wildlife sanctuary in the Costa Rican tropics. The 10,500-hectare reserve features incredible biodiversity including 400 species of birds, more than 100 species of mammals, 120 species of amphibians and reptiles, and about 2,500 species of plants, which you’ll be able to spot with the help of a guide. Take in the rainforest as you travel along a series of trails connected by suspended bridges. Great experience! Great guide! Wonderfull day!